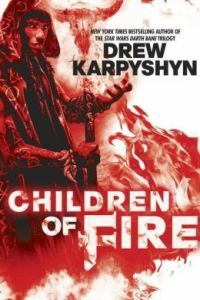 Children of Fire is Drew Karpyshyn’s original epic fantasy novel, and the first of a trilogy. The plot moves along well, in a new universe with enough details to be original and enough standard epic fantasy elements to make it easy to follow. I found myself reading the story quickly, immersed. By the time I got to the epic battle at the end, I was rapidly flicking pages on my phone’s e-reader. What really hooked me, though, were the diverse main characters. First is Keegan, a powerful Chaos/Magic wielder raised by his father and trained by an ebony-skinned Wizard. Scythe is a dark-skinned Islander girl who was raised by a healer and ends up as a street-savvy thief. Cassandra is an orphan raised by a wealthy family but taken by The Order when her second sight powers are revealed. Vaaler is a green-skinned Danaan Prince who, much to the chagrin of his mother, is without the necessary magical abilities required of a Danaan ruler. The main characters are supported by a host of interesting secondary characters. Jerrod is a fanatical, heretical Monk. Norr is a gentle giant and Scythe’s unlikely lover. The vivid settings from a forest kingdom, to tundra and pirate ship are varied and interesting without being distracting. While Children of Fire is well written, a few moments of more telling than showing slow the plot. They are few and far between, though, and mostly used to convey background information. 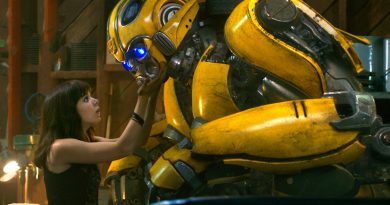 Some of the familiar fantasy elements in the book might be considered cliché, but these elements are presented in a fresh manner. Children of Fire is also the third of Karpyshyn’s books that starts with a pregnancy or birth! Children of Fire is engrossing, and full of characters that are modern. Considering this is a genre I usually avoid mainly because I don’t identify with most of the characters, I thoroughly enjoyed Children of Fire and look forward for the next two books. The publisher provided FANgirl Blog a review copy of this book. Linda has been a Star Wars fan from the time she saw Episode IV in the theatre with her parents and insisted on being Han Solo while playing with the neighborhood kids. She’s now a fangirl who splits her time learning to twirl a bo staff like Ray Park, jumping horses, writing fanfic she dreams up on her commute to work, and spending time with her husband and their own feisty Padawan version of Ahsoka. She can be reached at theadornedunicorn@gmail.com.